DEAR MARY: This is a really tough question to answer. There just isn't a clear cut answer. I'm afraid it will boil down to an analysis of your personal texture and color preferences, mathematics, and how much long term work you want to put into your new deck. Let's start with wood decking materials. I feel that a vast majority of people will agree that natural wood is the most visually appealing deck surface. The grain patterns, hues, and shades of different species such as redwood, cedar, cypress, and treated pine products is unparalleled. The synthetic decking systems have yet to produce a product that rivals the natural beauty of real wood. Wood naturally absorbs and dissipates solar energy. In other words, you can walk across many wood surfaces that have been in direct sunlight for hours without burning your bare feet. The beauty of wood comes with a price tag. Wood deck surfaces require periodic treatments with synthetic wood preservatives and sealants. These products minimize damage caused by the sun's ultraviolet light and water. Synthetic sealants are not a food source for mildew and algae. Many highly advertised wood sealants contain natural oils that feed these organisms. 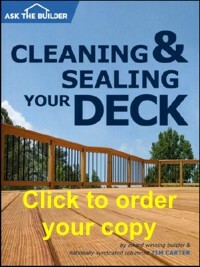 Even the best deck sealants last only 2 to 3 years before re-treatment is necessary. There are several types of alternative decking materials. Some are virgin vinyl materials. Others are made from recycled plastics or plastic resins and combinations of wood dust or fibers. You can even get aluminum decking materials. Many of these systems come with accessory railing and trim kits so that your deck will have a truly finished look. Many, if not all, of these products are applied to a traditional treated lumber joist and beam system. This allows you to do your cost comparisons quite easily since the structural aspects of your deck will be virtually the same no matter how you finish the top of the deck. However, you can now purchase, in some markets, plastic joist and beam systems. These materials are completely rot resistant. Their only drawback is that they are bouncy. To achieve a stiff deck surface you need to oversize the plastic joists and/or space them closer together. This of course requires more labor and money than traditional wood. A positive aspect of many alternative decking materials is that they require no periodic applications of sealers. The virgin vinyl products will look just like vinyl siding does after 10 or 15 years. Most decking materials that contain recycled plastics or resins and wood fibers or dust will weather to a gray color. The manufacturers tell you that these materials are stainable or paintable to achieve desired coloration, but if you do this, you start the vicious and never ending cycle of periodic maintenance. The virgin vinyl products probably offer the best choice if you want minimal future work. However, on a sunny day, I guarantee you that you will need sunglasses and a pad while resting on the deck. These light colored materials readily reflect sunlight and can get quite hot. Don't forget that light colored decking products will require annual or monthly washings. They will show airborne dirt much more so than regular wood decks. Before you make your final decision keep in mind that all decks will have to be cleaned on a routine basis. If you choose to go with natural wood, you will just have to calculate the annual or periodic cost of sealing the deck on a square foot basis and add this to the original installed price. Compare all systems on a simple square foot price completely installed. Factor in how many years you think the deck will last before you want a change. Divide the cost per square foot by the number of years and you will see the annualized cost of your new deck. Building a deck? Make the best decisions with my helpful and thorough Deck Installation & Repair Checklist. I offer a 100% Money Back Guarantee. After this column ran in the newspapers I received several letters and e-mails from vinyl decking manufacturers. Some of them objected to my editorial comments. Certain vinyl deck manufacturers claim that their materials are actually cooler to the touch in direct sunlight than wood. My advice is for you to visit a home or business that has the material you want to use in place. See for yourself if the decking is hot, warm, or cool. Look to see how clean it is. Take off your sunglasses while you are there as well. In other words, test drive your decking before you buy. Since this column was written a substantial amount of different alternative decking products have been introduced to the market place. Many are composite products that mix either virgin vinyl or recycled vinyl/plastic with either new wood fibers and/or recycled wood fibers. As with vinyl siding, the manufacturers of many of these products are doing whatever they can to mimic the look and feel of real wood. I think they do this because many of us love the actual look and feel of real wood. Perhaps the most interesting thing about these products has been the turn-around I have witnessed with respect to the stance on maintenance. Years ago when these products were introduced, many said they were "maintenance-free". I disagreed then and disagree now with that stance. Most of the sales literature from the alternative decking materials now says "low maintenance" not no maintenance. So therein lies the problem for the average consumer. What does it really cost to maintain a wood deck over time vs. the cost to maintain a deck built with one of the composite materials? Do you really get a payback? Finally, don't ever believe you save money right out of the box when you buy a more expensive product. I have seen literature for these composite decking materials that say they save you money. You never save any money until such future time that you actually have gotten back the extra money you spent originally. Furthermore, to really save money you need to get backany interest you may have made on that money while it sat in a bank account. I just thought I would add my two cents about vinyl decking. We had Durable Deck(R) (DD) placed over our old wood deck. It was a nightmare. If the wood beneath became dry the DD morphed. The deck was dirty all the time. It was easy to clean but who wants to scrub the deck every single day with full strength Simple Green or 409 and a scrub brush? It had to be swept, scrubbed and even blown off in the direction of the embossing. The dirt and pine tags and debris collected in the spaces between the stuff and were tedious to remove. It was not hot to walk on like the wood but when it was wet it was very slick even with rubber soled shoes and when we pushed snow off the first time I nearly broke my neck sliding. We have pulled off about 1/3 of the DD. Not an easy task since the installer put about 70 screws in each 20 foot board. The amount of dirt and debris under that portion was about a 5 gallon bucket worth. The wood under the vinyl was very wet and soft (hence rotting)........ Just thought I'd give you the scoop on DD. It may work fine in Florida on docks and around swimming pools but not on an 800 square foot deck in Virginia. I just finished writing an explosive new column about the newer wood composite decking materials. I urge you to Click Here to read it. Randy, I'm in the middle of a massive real test of 18 deck sealers. You should see what they look like just after 6 months! Go back to my AsktheBuilder.com site - you should be here now reading this - and sign up for my FREE newsletter. I'm going to release in the early spring before and after photos. You'll be blown away!